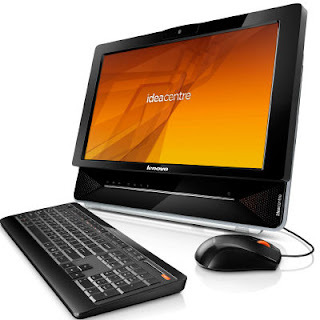 Lenovo has launched its new All-in-one PC for the Indian market called the IdeaCenter B300. This mainstream PC will be available at all retail outlets and multi brand digital lifestyle retail chains for Rs. 29,990 onwards with a 1-year on-site warranty. The specifications will vary depending on how much you're willing to pay. For the CPU, you have a choice of a Core2 Duo 7600/5400s/Core i range. Memory options start from 2GB DDR3 onwards whereas for storage, you again get multiple choices up to 1TB. The B300 with a 20-inch screen features a 1600x900 resolution where as the 21.5-inch screen will sport a full HD resolution with LED backlighting and multi-touch on select models only. On the graphics front, we have a choice between the onboard GMA 4500MHD or a ATI Radeon HD5450 with 512MB dedicated memory. Other featurs include two 3W speakers, 10/100 Ethernet, Bluetooth, DVD burner, card reader, built-in webcam and a keyboard and mouse. The B300 will come shipped with Windows 7 Home Premium 32-bit or 64-bit depending on the amount of RAM.